"Dumbbell Workouts - How Dumbbell Training Built 'The Strongest Man on Earth'"
How did dumbbell workouts build 'The Strongest Man on Earth'? Discover the insider secrets behind your bodybuilding bells. When most folks picture dumbbells, they imagine a pair of rusty bells stashed in a neighbor's garage or buried in a parent's loft. A spur-of-the-moment purchase, these muscle building tools are soon cast aside in favor of a gym membership, or worse, a sedentary life crashed out in front of the television. However, what few trainees realize is how effective a muscle building tool dumbbell training can be. Believe you can't build some serious muscle and strength using just bells? This is an all-too common fallacy, and one I hope - with some help from history - to disprove. For our proof, we need to revisit the turn of the last century. The place? A smoke-filled Royal Aquarium in London, England. On stage, two men do battle over a glittering prize. At stake, the honor: 'The Strongest Man on Earth'! The young German's lifts that evening, were to include a mighty clean and press from the shoulder of 250 lbs (the young fellow was to later better this to 315 lbs) in addition to other daring strongman feats, such as snapping an iron chain with the flexing of his considerable chest. While mightily impressive, what makes this story all the more incredible, is that this young German built his amazing strongman physique primarily using dumbbells. This blossoming behemoth was the godfather of muscle building. His name? Eugene Sandow. To claim your FREE copy of Eugene Sandow's classic "Strength and How to Obtain It" simply enter your name and email below. Eugene Sandow was to forge his remarkable physique using light dumbbell training. These training methods - such were their efficacy - were later adopted by the armed forces with amazing results; and soon, the ordinary fellow in the street was to adopt this style of training into their own lives. This pleased Sandow greatly, as it was his cherished dream that strength, health and fitness be available to all. So what can this style of workout do for you? These results are achieved by following proven muscle building principles. 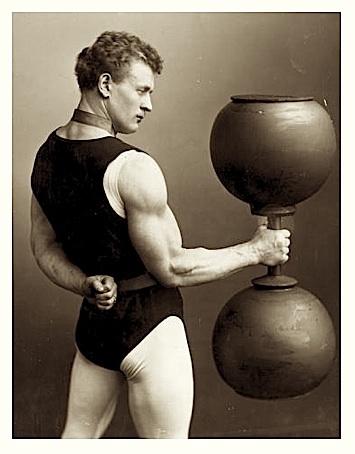 Indeed, it was commonplace for many of Sandow's students to make spectacular gains fast. For example, 3-4 inches ADDED to a chest measurement, or 4-5 inches taken OFF a trainees waist - results that were often achieved in weeks! And remember: some of these gains were realized using dumbbells weighing little more than 5 lbs! Dumbbell workout that deliver on their muscle building promise are no different to traditional barbell training in their execution. Moreover, your selection of dumbbell exercises should be mass-builders, i.e. compound exercises, thus yielding the best results in the fastest possible time. A glance backwards to the turn of the century shows what can be achieved by following a simple, yet effective system of training. To learn more, claim your FREE copy of Eugene Sandow's classic "Strength and How to Obtain It".